The Arenal volcano region of Costa Rica is a place that begs to be explored. 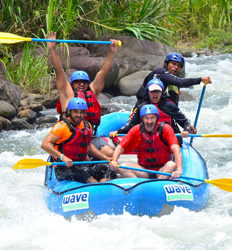 An Arenal white water rafting tour is not only a great adventurous way of doing this, but also the most FUN!!! The spectacular scenic rivers surrounding the Arenal region are some of the most spectacular in all of Costa Rica. White water rafting La Fortuna attracts thousands of river runners each year who come in search of both adventure and relaxation. Really, can you think of a better day than challenging yourself on some of the most popular white water rapids in Costa Rica then soaking off the day in Arenal hot springs? Nope, we did not think so either. You don't have to be an extremist to enjoy white water rafting in Costa Rica. There is a river for each skill type featuring several classes of rapids ranging from 1 to 5. 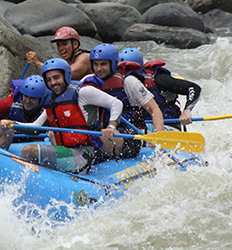 The 3 main rivers that offer white water rafting in La Fortuna include the Balsa River, Sarapiqui River and the most famous and scenic of all, the Pacuare River. Each river offers a different style of white water rafting. Adrenaline junkies will love those that plunge and swoop you through world class III and IV rapids. Those less adventurous will enjoy the lazy river floats that carry them on a leisurely stroll down the river at a pace that is excellent for watching birds & wildlife. La Fortuna is one of the best places in Costa Rica to try white water river tubing. 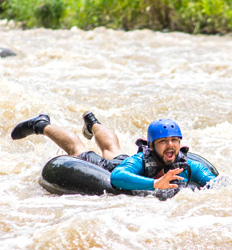 Though river tubing usually takes place in class I/II rapids, they can feel equally as challenging as rafting class III rapids when trying to navigate the rapids on your own tube. Our advice for first-timers white water river tubing? Just relax and go with the flow. We offer both a bit more challenging white water river tubing adventure on the Balsa River, as well as a more family friendly river float at the Club Rio at The Springs Resort Arenal. If you can't decide on rafting or tubing, you can try them both out in one day and decide which you like best. White water rafting in Arenal is probably one of the most common activities in La Fortuna as a matter of fact. 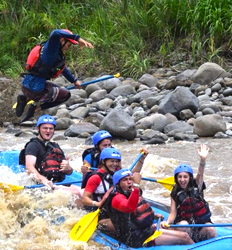 Needless to say, there is no shortage of money saving combo tours in La Fortuna that involve rafting. You can spend the first half day fulfilling your dream of rafting in Costa Rica, and the second half on any one of the other many adventures in Arenal. Families can add on the famous Arenal hanging bridges or a chocolate tour. 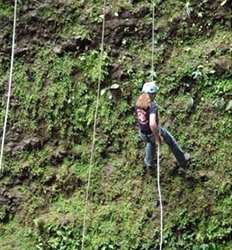 More adventurous travelers may opt for a canopy tour a canyoning & rappel tour combo. There are plenty of different money & time saving La Fortuna rafting combos to find the right one for you. One day of rafting in Costa Rica just not enough? Then opt for one of the overnight or multi-day rafting tours. We also have white water rafting connection tours. The Pacuare River Rafting Adventure is available departing from Arenal, San Jose & Puerto Viejo. World Class rafting on the Pacuare River plus transportation between destinations? This is probably the best deal in Costa Rica if you ask us. Why Book Your Arenal Rafting Tours With The Real Deal Tours? 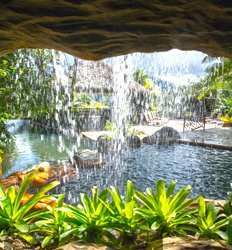 Here at The Real Deal Tours, we hand-pick our tour providers from among the best in Costa Rica. When you book your Arenal Rafting adventure with us, you will know you are getting not only the best price, but the best service as well. You can count on us to provide you with top of the line rafting & safety equipment, only the best certified rafting guides and the most amazing rafting experience in La Fortuna. There are a lot of things you should know before you go rafting in Costa Rica. We invite you to check out our blog published by our team who has experienced these tours first hand and can provide you with up to date helpful tips. Book your La Fortuna rafting experience of a lifetime online today! With The Real Deal Tours you know you are getting the best tour deals in Costa Rica. Our whitewater rafting tour on the Balsa River is just what you are looking for! Whether you are staying in Arenal or San Jose, the Balsa River has a class of II and III white water rapids that are perfect for beginners yet challenging enough to satisfy all adventure levels in your family. Smart Connections Deals Balsa River II-III deposit is $14.00 per person. If you are vacationing in Costa Rica, this is a whitewater rafting trip that cannot be missed!! The Sarapiqui River class III & IV technical roaring rapids and large hurtling waves will challenge even the most experienced of white water river rafters!! 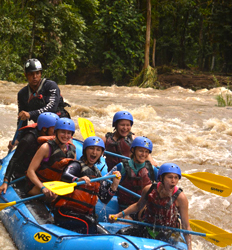 Sarapiqui River White Water Rafting Class III & IV deposit is $15.00 per person. 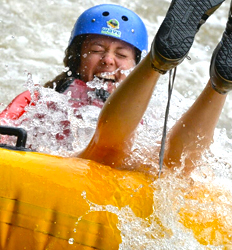 If you’ve got a whitewater rafting itch that needs scratching, but you’re also short on time, check out this half day trip on the Sarapiqui river (Class II/III). A great way to get some time on the river and still have plenty of day left for other activities. 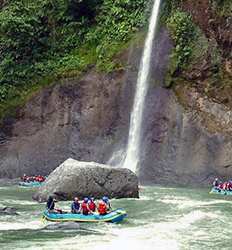 Sarapiqui River Rafting Express Tour deposit is $14.00 per person. All the fun of whitewater rafting in a more approachable package. 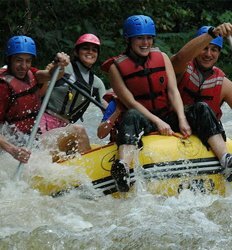 Experience Class I/II rapids on a tube, among the very wet and very fun things to do in La Fortuna that can’t be missed! Paddle and maneuver your way along the picturesque Balsa river, having the time of your life the whole way! 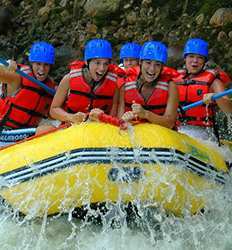 Balsa River White Water River Tubing Costa Rica Tour deposit is $15.00 per person. The ever popular Costa Rica canopy tour and a white water rafting adventure down the Balsa River that will make your heart jump from start to finish! 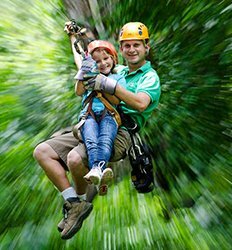 Fly above rainforest canopy across 9 zip-line cables of pure ADRENALINE while enjoying the stunning views. Canopy zip-lines, rappelling, and white water rafting all in one day! Canopy & Rafting Balsa River Class II/III Combo deposit is $20.00 per person. If you are seeking out adventure in Costa Rica, you have arrived to the right place! Get your adrenaline pumping on this exhilarating Canyoning & Waterfall Rappelling Tour and rafting combo tour in Arenal! Adrenaline junkies, why wait? Book your epic Costa Rica adventure on our discounted rafting and rappel tour in Arenal online today! Rappel & Rafting Combo deposit is $30.00 per person. On this trip we go high and then we go low! See the jungle from two very different vantage points in one super fun day you won’t want to miss! Walk along the very same hanging bridges that scientists use to get in touch with the wildlife. Then, fly down the Balsa River on a wet and wild rapids adventure! Balsa River Rafting + Arenal Hanging Bridges Combo Tour Tour deposit is $25.00 per person. Not quite ready to take on white water rapids? Club Rio at The Springs Resort includes activities such as inflatable kayaks and tubing on the Arenal River. Get a taste of the river then soak in the soothing hot springs. That is our idea of a perfect day in paradise! Get ready to get wet and wild! White water rafting and white water tubing, two great activities that go great together, are now in one fantastic tour that you won’t want to miss! Experience the Balsa River like never before: fast and slow, on a raft and on a tube! 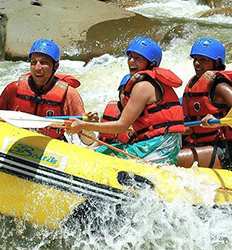 Arenal Rafting + River Tubing Costa Rica Tour deposit is $20.00 per person. Rafting Balsa River class II-II rapids are not for the faint of heart! 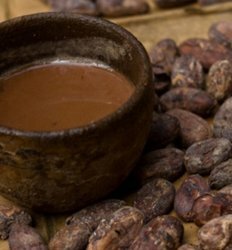 Add in a lovely horseback ride in the rainforest, and a hike to one of Costa Rica’s most beautiful waterfalls and you have one heck of a Costa Rica eco adventure! Hands down, the best way to travel through Costa Rica is the Pacuare Paddle & Hike 2 Day Expedition! 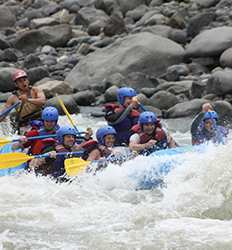 This river rafting adventure is perfect for those thrill seekers who are looking to test their paddling & hiking skills on the premiere whitewater rafting in the Pacuare River. Make the best of your vacation in Costa Rica & travel smart.